The amount of 22 USD has been deposited to your account. Accounts: U19552422->U5046599. Memo: API Payment. Withdraw to hyipregular from BitCartel.. Date: 09:16 11.04.19. Batch: 255307399. The amount of 30 USD has been deposited to your account. Accounts: U19552422->U5046599. Memo: API Payment. 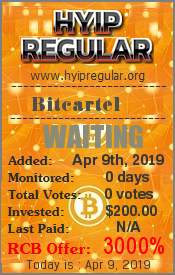 Withdraw to hyipregular from BitCartel.. Date: 02:41 15.04.19. Batch: 255834338. The amount of 20 USD has been deposited to your account. Accounts: U19552422->U5046599. Memo: API Payment. Withdraw to hyipregular from BitCartel.. Date: 03:47 17.04.19. Batch: 256178485.